The sun is shining and the birds are singing... spring is definitely in the air! For me, that means it's a great time to bake something. I haven't done much baking since the holidays, so I've been itching to pull out my mixer, fire up my oven, and get down to business making a sweet treat. I didn't have anything in mind last week, but sometimes inspiration comes when you aren't really looking. 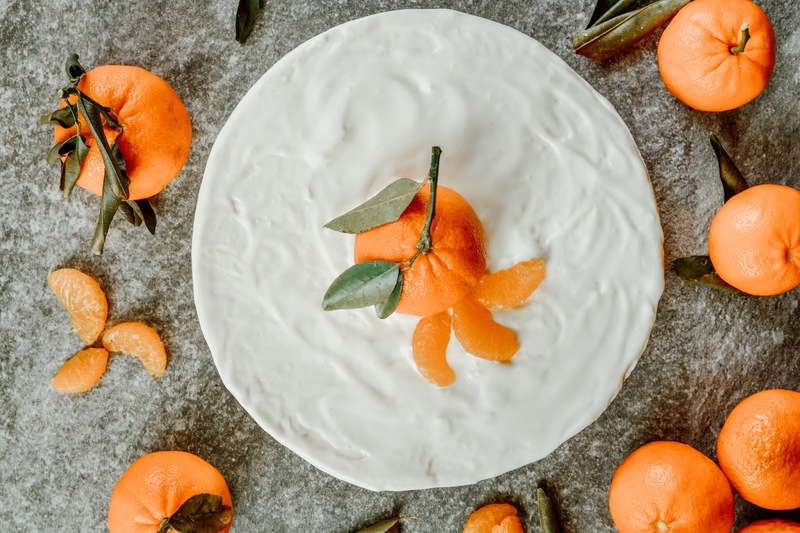 I was at Fresh Thyme and saw these cute little mandarin oranges and thought they'd look especially lovely on a cake. 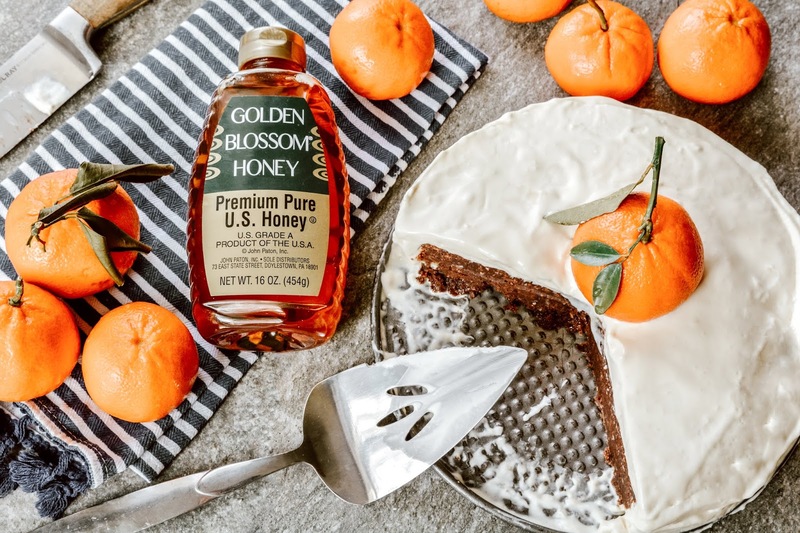 So, I brought some home, headed to Golden Blossom Honey to see what they had in the way of cake recipes, and lo and behold, there sat this Heavenly Orange Chocolate Mousse Cake that was just begging for me to make it. The cake is great served as is, but with the temperatures starting to warm up now, I really like to keep it stored in the freezer instead of the refrigerator because then it's more like an ice cream cake. And who doesn't love a slice of ice cream cake? I know I do! The the orange and chocolate is such a fun springtime and summertime flavor combination, you'll get a lot of mileage out of this recipe using it all the way through the end of summer. I want to point out that the recipe did call to sift cocoa powder over the top of the cake, and in my haste to dig in, I forgot to do that. Whoops! It does already have a strong chocolate flavor, so flavor wise, it's unnecessary, but if you're going for presentation, make sure you don't forget this step like I did. What's one of your favorite things to make once spring hits? Looks so nom, especially the second photo! I do much prefer mandarines to clementines. You did a great job with it indeed. Since our offer in the shops and markets is always seasonal, when spring hits we all throw ourselves on radishes, spring onions, spinach and such thingalings. Sure inspired by spring indeed at your feed. Let's hope it stays that way and no more snow shows. Oh goodness, that sounds really good. That looks so good! I love the flavors here. They sound wonderful. Awesome recipe! I can't wait to try this! Wow that looks and sounds truly amazing!! Yes please! I'll have a piece. It sounds great. This looks so good. I love oranges and I have to make this for our next great celebration! For one, that's such a gorgeous cake. Two, BOY, does it sound absolutely delicious! That certainly looks heavenly! Wish I had been a guest at your house that day. :) Perhaps I try this recipe out myself. I rarely get a taste of orange and chocolate combo. I'll give your recipe a shot. What a great recipe! I love the orange on top too; good idea and very eye catching! Love the blend of fruit with chocolate; excited to try this for the Easter holiday! What a great recipe for the upcoming holidays. Friends and family would enjoy this. Oh My.. Theresa, It looks beautiful and I bet it tastes heavenly! My daughter and I love oranges so very much we both can eat kilos of oranges! Happy to try this recipe at home..
What a good idea to freeze it!! Orange and chocolate is such a good flavor combo and this is prefect for this happy, peppy weather we're having. Orange and chocolate happiness all around!! This recipe sounds delicious, Theresa! I haven't been baking anything lately, because I have eight pounds to go. I'll have to live vicariously through your photos and recipes for the time being! Have a good one!